My Illustrated World of Warcraft Diary: Day 200 - I'm not dead! I'm not dead! 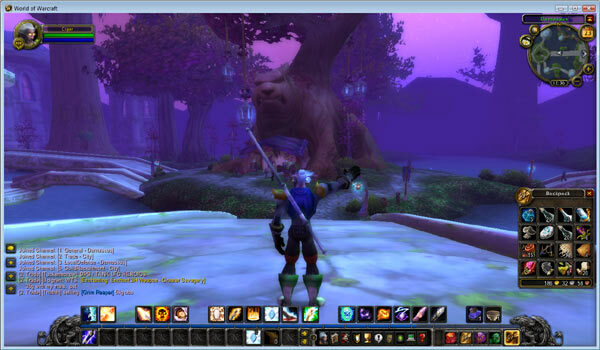 My brother started playing Wow again and I decided to start a character on his server: Nordrasill. I started an Elf Priest named "Cigar", my second character in Wow and first exploration into the spell-casting set. I chose herb gathering and alchemy as my character professions. Last night I pinged level 20, and found myself fighting Mathystra Mermen on the northern edge of Darkshore, trying to gather six relics for an ancient tree-man in the...yes..Grove of the Ancients! I had this idea somehow that playing a priest would make me a desirable addition into groups, but I've only been in a few with this character. Less than 10. Partly to blame is my playing schedule, which is that I play for about 45 minutes at a stretch, which is hardly even enough time to get to know someone in game. I have started to make announcements in the "General" chat channel about my intentions, to see if I can find anyone else on the same quests/ready for similar encounters. I've only had one taker, but it worked out really well. He was a level 30 warrior and our blackwood prey was completely outmatched. I barely got a chance to heal him! Also, I've done some fishing with this character, which was an awesome instant cash infusion! Two words: oily blackmouth! Oh man. My brother clued me in that they sold for big money in the auction house, so at level 9 I took the time to hook a stack of 20 and put them in the auction house. 3 gold! Bam! I had never had this much money (at such a low level) with my warrior character. So, I'm happy to get priesting advice. This is my first opportunity for resurrecting people, healing and general spellcasting. Last night I started in Darnassus auction house, ready to finish up my business from the night before. When I checked my auctions, I only had four still going. Wow! I had initiated about 20 auctions the night before, and staggeringly, almost all of them had ended! Someone bought all of my crap! Alright! On my way over to the mailbox, someone...bloodymouse? yelled on the general channel that he was looking to sell a netherweave bag for 5 gold. I told him yea, but that I would have to wait a minute before I could pay, because I was on my way to pick up my fresh money from the auction house. Anyway, he offered to just mail it to me COD, and I let him know that would be great. The mailbox had a ton of money in it, 17 gold total, from about as many auctions. This was great. I guess that is what happens when you sell raw materials over the weekend. I also did a little auction-gaming, buying some pearls at a very low price and selling my own for a higher price. I jogged and flew back to Darkshore, feeling rich because I had about 20 gold, (which is a lot for my 21st level character, in my opinion). I checked my quests, and just before I left town, I checked the mailbox one last time. Yes! My bag had arrived. I quickly sent the seller his money, and went to pick up the bag. ACH! I totally spaced on how the COD mechanism worked. I couldn't actually pick up the bag without paying another 5 gold! Ah!! Well, I picked it up anyway, and quickly sent a letter to bloodymouse, asking for my second payment back! Rats! Then I ran south and hooked up with a Draenai Priest in an attempt to kill Murkdeep the Murlock. That was fun! Two priests against an ugly mob of fish men. A lot of holy fire and complimentary healing.